It was months ago that Gavra Koljesar, a former journalist from Novi Sad, Serbia, shared with me the works and the biography of his cousin, a Rusyn photojournalist, a documentary and a fine art photographer, Vladimir Dado Koljesar. Koljesar was born in Novi Sad and lived in Ruski Kerestur his whole life. As a member of a club Druztvo, he supported the Rusyn language, culture and literature. He had five joint and seven solo exhibitions. Vladimir was tightly connected to Kerestur, one of the oldest Rusyn towns. Gavra Koljesar writes: “Through his lens and on the film are captured the moments when Kerestur was happy and celebrating, but also when it was sad and crying.” No subject matter was too ordinary for him: plowing the field, fishing, Easter, school events, weddings, views of the nature… Koljesar was looking for poetry in the scenes around him, for simple, accessible, but innately beautiful rhymes that could be read and understood by everybody. I think that Gavra is right to suggest that it was the two landmarks of Kerestur (the church and the castle, and their Rusyn-ness), which the artist saw growing up so readily from his house that unconsciously shaped his close relationship with the town. Being confronted with powerful testaments to faith, continuity and community reminds one about things that are larger than the self and towards those Koljesar was turning his lens. Last November, Daniela Kapralova, Bohus Tabak and Peter Holly exhibited together in Humenne, Slovakia, and the title of their exhibition was “The Village.” It was basically a photographic documentary, a subjective one, that is. Everyday moments of the life in several villages in Slovakia and Belarus (Zazriva, Sumiac, Stakcin, Cuchovo) were captured and presented to the audience in a month-long exhibition. Let’s have a cup of coffee and let the images pass in front of our eyes and see what we can take from them – I hope for a truly human experience. Thank you, Bohus Tabak, for letting the viewers embed your YouTube video. Ljubica Fa-Hardi was born and raised in Ruski Kerestur, Serbia, but in 2000 she relocated to Canada where she leads an active, artist/architect life, now in Saskatchewan. Ljubica does portraits and illustrations, she is an art instructor and architectural designer, but what she pointed out to me were her photographs. The works you see below belong to Kerestur 2012 Series and show just how much invention Ljubica is capable of, and how much soul she puts into her work. Exploiting focus and intensely blurring the areas of choice plays with the viewer’s eye in somewhat disturbing ways, literally pushing it to find solace in the object with clear, sharp outlines. And in that find, a rush of emotions bursts out from such objects, and soothes the heart looking for meaning, for anchor. In some photographs, the close-up is so skillfully employed that you do not quite know what you are looking at, but the play of colors and shapes is so wonderful that it turns the photograph into a variation of a Color Field painting. In others, you find short glimpses of the past and present through the tiniest things that go often unnoticed… but not by her. 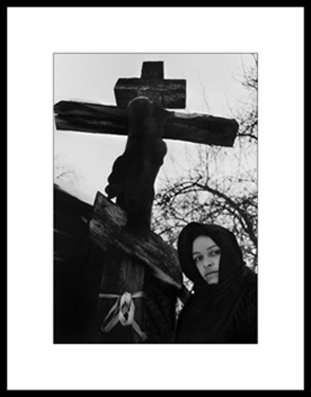 Even before I read the articles a Rusyn photographer Jozef Laurusky sent me about his work, I saw it. I saw in his photographs how closely he is trying to capture the psychology of his subjects. His portraits are touchingly authentic and unpretentiously beautiful, his landscapes catch moments that will not be repeated. Laurusky was born and raised in the village Ruske near Snina, eastern Slovakia, which was one of the villages evacuated and taken down when a dam – Starina – was built. He is strongly connected to his roots and he documents this well in a series of photographs showing Ruske. The views Laurusky offers strike the chord with people within the culture, but at the same time they are potent enough to introduce that culture to the outsiders. How? Through honesty. Laurusky lives and works in Humenne, exhibits his works at home and abroad and participates in different competitions and projects that cross the borders, just like the message of his works. A Rusyn photographer Daniela Kapráľová, was born, curiously enough, in my hometown, Snina, eastern Slovakia, on the same day I was born, only some 25 years earlier. I did not find much information about her online and I have only recently been able to get in touch with her in person. She provided me with her biography and several photographs, some of which took me by surprise, I must tell you. Her studies and work rooted her firmly in art history, museum educology and photography. She is a member of PhotoArt Centrum and cooperates closely with CEE PhotoFund. She worked as a curator and educationist in Andy Warhol Museum in Medzilaborce, Slovakia, where the second largest collection of Warhol’s artifacts is housed. She is now the curator at Sninsky Kastiel in Snina. Looking through her work will leave you with a feeling of entering a very private world of people and moments you should not be seeing, but you are – through a very private eye of a photographer, who does not let you blink, let alone look away. She manages to carefully manipulate the angle and the subjects in ways that shake you out of your habitual perception of photographs, and eventually, of the world itself.